In agricultural industry, the process of orchards spraying is of extreme importance to avoid losses and reduction of quality in the products. In orchards spraying process an equipment called sprayer tower is used. It consists of a reservoir and fans mounted over an articulated tower, which is supported by a vehicle suspension. Due to soil irregularities this equipment is subject to random loads, which may hamper the proper dispersion of the spraying fluid. 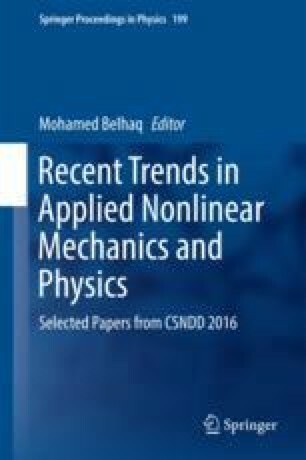 This work presents the construction of a consistent stochastic model of uncertainties to describe the non-linear dynamics of an orchard sprayer tower. In this model, the mechanical system is described by as a multi-body with three degrees of freedom, and random loadings as a harmonic random process. Uncertainties are taken into account through a parametric probabilistic approach , where maximum entropy principle is used to specify random parameters distributions. The propagation of uncertainties through the model is computed via Monte Carlo method. The authors are indebted to Brazilian agencies CNPq, CAPES, FAPESP, and FAPERJ for the financial support given to this research. They are also grateful to Máquinas Agrícolas Jacto S/A for the important data supplied.